Catering specifically for coloured hair, the OKARA Radiance Enhancing Hair Mask from René Furterer works to revitalise and replenish strands from root to tip. Combining the reparative benefits of a mask with the lightweight formula of a gel, the regenerating treatment expertly softens and rejuvenates, whilst detangling and improving manageability for a salon-worthy finish. 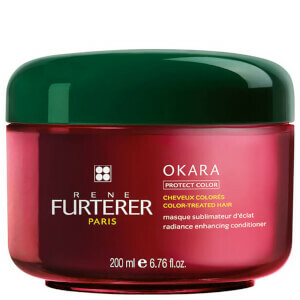 Extracts of Witch Hazel and Okara (a plant-based active ingredient derived from Soya Beans) penetrate deeply and infuse powerful amino acids into damaged hair to repair and restructure from within. Expect smooth, sleek locks with healthy-looking shine. 97% natural origin active ingredients. Apply a dab to hair that has been towel-dried thoroughly, smoothing it through each strand, from halfway down the length of your hair to the ends, to fully smooth hair cuticles. Leave on for 2-5 minutes. Detangle. Rinse abundantly until your hair is clean. Use 1-2 times per week.